Welcome to Daily Fantasy Cafe! Daily fantasy cafe is one of the largest daily fantasy sports communities online. We help over 60,000 daily fantasy players win more by providing advanced fantasy tools, training, content and community support. We provide free training courses through the Daily Academy for users of all levels. We offer free and premium content written by daily fantasy players who have proven results. 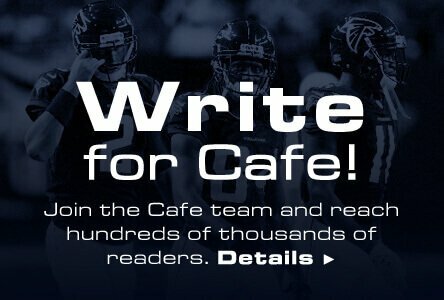 Cafe writers have proven over the last 5 years to be some of the most accurate fantasy experts in the industry. Our tools are some of the most advanced in the daily fantasy sports, allowing you to win more through customization and advanced options. Join us today and give yourself the best chance at winning more. After a year of legal clarity up in the air, the status of FanDuel and DraftKings became more solidified. Confidence is high to keep growing in 2018, as both sites are quietly getting back to advertising and spending on products within their sites. Prize pools remain enormous, and sites are continuously adding spots. We saw FanDuel launch their PGA product, while recently DraftKings went into Euro Basketball. Daily Fantasy Sports has gotten back on path, but caution still needs to be had. A push for a third site in the daily fantasy world continues to be between Yahoo and FantasyDraft, yet FantasyDraft has garnished a lot of interest around the industry over the last few months. As FanDuel and DraftKings continue to dominate the industry, growing frustration with issues like late-swap, rake, and product performance have been voiced loudly. FantasyDraft has taken notice of those issues, and worked to incorporate fixes into their product. While the legal issues were in 2017, satisfying the current players needs to be a priority in 2018. Minor sports continue to make appearances in DFS, as E-Sports, MMA, NASCAR, Soccer, and Canadian Football are having steady contests put out at a weekly rate. While the prize pools cannot rival the major sports, there is something for everybody when it comes to daily fantasy. This is a positive sign for new and old users who want to learn something new or play what they know. In 2018, we will be partnering with Lineups.com to provide machine learning projections based in data science. Lineups.com provide breaking NFL depth charts as well MLB starting lineups each day as well. You will be able to purchase their premium projection in our lineup optimizers. 2018 should see much of the same from the last few months, with states pushing new regulatory bills across to legalize and control daily fantasy, but not much movement has been made in states that have been ineligible from the beginning. DFS is in a much better spot than where it was at this time a year ago. The Cafe team has been entrenched in fantasy sports for over a decade. Since the rise of daily, our team's success has translated into millions of grossed dollars won and an unprecedented number of Top Accuracy awards on Fantasy Pros. The daily fantasy sites featured on dailyfantasycafe.com are legal to play on if you are located in the US & Canada. Our “Top Rated” sites will pay out an average of over $15 million each week throughout 2015. We love season long, but the future may be in daily. Daily Fantasy is exponentially more fun than season long fantasy football, fantasy basketball, fantasy baseball or fantasy hockey, simply because you are able to experience a draft every day you play. When I first jumped into playing daily fantasy football, my primary concern was whether it was legal and I wanted to be 100% certain I would get paid when I won. I have a poker background and know what it's like for overseas companies to close up shop and take my account balance with them to Europe. It wasn't a good feeling. “Trustworthy” and “reliable” were at the top of my list of criteria I was looking for in a daily fantasy money league website. I quickly found that all the daily fantasy sports sites are US or Canada based businesses and the main difference with this industry is that it's legal by US Federal law. You can read more about it on our Legal Page. Once I felt good about the legality, I started looking for the best site with the largest player base and most action. This wasn't an easy task as I found about 10 websites that all claimed to be the top site with the best games. I learned the hard way and have played on and tested each of the top sites in the industry. In my first year, I came out ahead by researching and using logic that we share on dailyfantasycafe.com. You don't have to win first place in each tournament to make a profit. For a nice introduction and strategy outline, start with the Daily Academy course. Our reviews are real, raw and contain exclusive information straight from the daily fantasy sites. We interview the owners, executives and managers to give you data and insight no other site can provide. We have the leading tools in the industry including the top FanDuel NFL Optimizer and DraftKings MLB Lineup Optimizer. You have the potential to become a millionaire in one weekend. In 2014 during the NFL season, a new millionaire crowned nearly every week of the season. Let that sink in. 16 people were made millionaires by playing in a daily fantasy football contest. You can win entries into these large tournaments for as little as $2 or buy a seat directly for no more than $200. Our job is to provide you with the best sites, the highest deposit bonuses and strategy to help you win money. Get started with your training at the Daily Academy. Daily fantasy contests are primarily daily or weekend contests. People refer to these contests as daily contests, but they NFL contests are really multiple days long. Virtually all of the contests are based on a salary cap draft. You have a salary cap and draft a number of roster of players. If your team has the highest score you win. Daily fantasy sites aren't going anywhere and with a bit of work and a lot of fun, you can start making money now. Don't wait, get started and we hope to see you holding that $1 million dollar check very soon. We have come a long way from the beginning of daily fantasy sports, and there seems to be new tools and data popping up more frequently. You might be curious as to what is new and old, as well as what is in store for the future. Lineup optimizers have been the calling card for many daily fantasy advice sites for some time, but now it is a race to see how advanced you can make it. We have also seen data and statistics geared specifically for daily fantasy sports. DraftKings points per minute, FanDuel points scored when a teammate is on/off the floor, you name it. Vegas lines are heavily involved in research these days, and sites have taken note of that. The amount of Vegas-DFS correlation info has really been on the rise in the last six-to-eight months. We are excited to see what is in store for 2017. Lineup optimizers are geared towards all skill sets. They have the basics down for the average skilled player, and the advanced options for those who want to learn, as well as for those who have been playing for a while. Optimizers are always a work in progress, due to the many possibilities that can go into them. We have seen applied models, exposure, excluding teams/players, and many more features in the last year. Optimizers are the arms race of the daily fantasy world. They are the muscle, and are always expanding. Research back in the day was fairly simple, and by back in the day, I mean 2012. You had your defense vs. position, Vegas lines, and some advanced stats to work with. You also had multiple tabs open, and research was a bit scattered. Things have drastically changed, and DFS statistics have been advanced. Information like how many fantasy points a player scores while a spread is in the double-digits is available, or fantasy points scored when a player is hitting third compared to fourth. Research and lineup constructing has gotten much more involved in the last year and a half. This has helped everyone in the industry, from the casual player who only has time to read an article, to the advanced player who researches hours a day. Our friends at Daily Faceoff are providing some of the best daily fantasy hockey information and data on the internet. They also offer a Draftkings tv promo code that is on par with every other offer today. Prefer FanDuel? DFO has that to, check out their fanduel promo code page. The amount of information, tools, and statistics out there now is baffling from where it was a few years ago. Us here at Daily Fantasy Cafe are intrigued with all this new data because it helps us make you successful. If you are wondering what's so special about Daily Fantasy Cafe, let us tell you. DFC brings you plenty of tools and content to help you succeed in any of the sports offered. Articles, podcasts, cheat sheets, and an abundance of tools are available for your daily fantasy needs. Our DFC team are seasoned fantasy sports veterans, and have been in the daily fantasy sports world since the beginning. They have a proven winning track record, and have a deep desire for helping you develop daily fantasy skills. It does not stop there as they are continuously researching theories to better the content and tools on the site. You will notice the passion and effort across the site. Our "Colossus" Lineup Optimizer is the bread and butter of our site. Colossus is the most powerful optimizer in the industry, and we never rest when it comes to making it even more powerful. Colossus generates lineups while maximizing fantasy points, and finding the best value. The user is able to customize and adjust settings before generating those final lineups, and you are also capable of importing your own projections. If you are not aware of our "Cafe Value" feature, it is simply the measure of a player’s points per dollar worth. This helps you get a gauge for what you are paying for a player. Colossus can go hand in hand with our unique stacking tool. Stacking is a strategy used in daily fantasy, and our tool helps you nail those high upside stacks, and import them into the lineup optimizer. Even though we have released these tools, our team is always looking for ways to enhance them. The content and podcasts provided daily is an excellent reflection of how our team enjoys their work. They have a solid track record shown in winnings, knowledge, and Fantasy Pros accuracy badges. You are truly getting content from skilled DFS players who enjoy what they do. Our cheat sheets are provided by these members, who are providing the same players they are using to construct their winning lineups. Providing picks is just a piece of the pie here at DFC. Our team is looking to help you learn the skill of the game, help you construct better lineups, as well as discuss sports happenings. Our forums and comment sections are a great place to sound off on ideas, picks, and to get advice. The team is devoted to answering each question with informative answers. The always evolving DFC tools are here to help you out, and our team enjoys the success of our site members. If you are looking for a proven winning track record, enjoyable and informative content, easy to use tools, and a growing community. DFC is the spot for you.